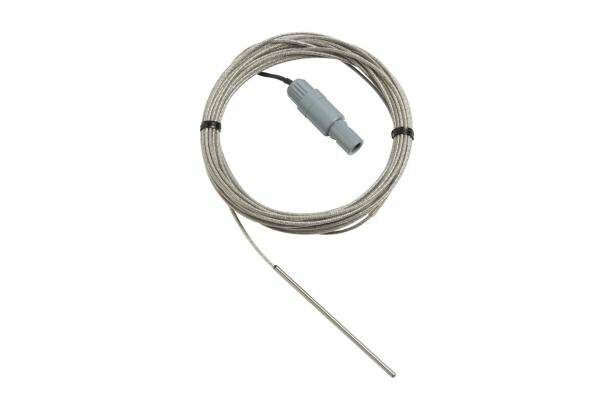 The 5611T is an especially versatile PTFE coated thermistor probe. With a PTFE encapsulated tip that is just 3 mm (0.12 in) in diameter and a PTFE coating that makes it impervious to most liquids, the PTFE Probe is handy for measuring in a wide variety of applications, including bio-pharmaceuticals. It's even immersible to nearly 20 feet and flexible enough that you could roll it up into a ball in your hand if you wanted to! 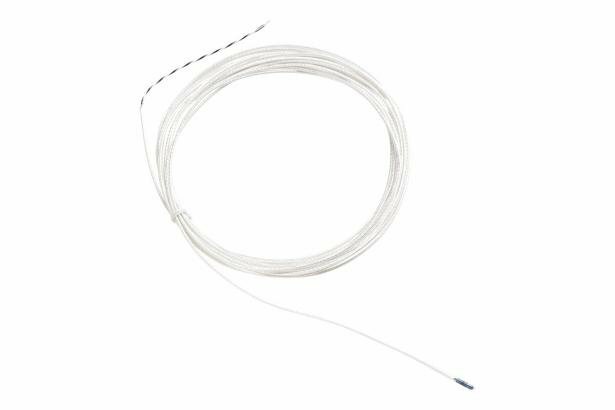 The 5611T's thermistor bead is encapsulated in a Mylar sleeve that is encapsulated inside a PTFE sleeve. 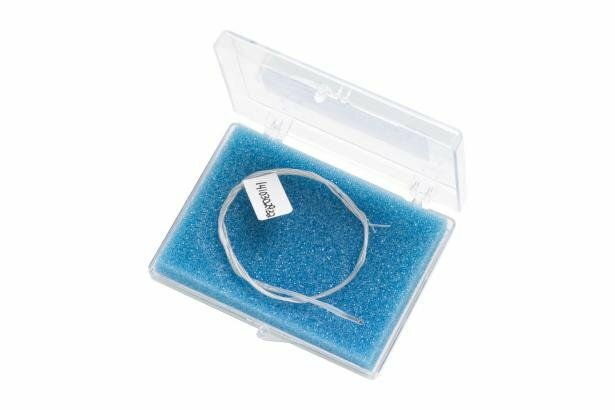 The PTFE sleeve is then melted around the PTFE-insulated cable, forming a moisture-proof seal. Our stainless steel metal-sheath probes include our 5610-6 and 5610-9 immersion probes, as well as our 5665 fully immersible probe. These probes are great for measuring in air, liquid or soil. With a diameter at the tip of just 1.5 mm (0.06 in), the 5611A's tip has the smallest diameter of any of our secondary reference thermistors and can fit nearly anywhere. Its faster response time, flexible sheath, and silicone coating make the 5611A great for use in many applications. However, applications involving silicone oil could damage the thermistor and should be avoided. All Fluke Calibration secondary reference thermistors have small diameters and very small sensing elements, which means they require far less immersion than a PRT to avoid errors caused by stem effect. Self heating is usually negligible, giving them an advantage when taking measurements in air. Their small size also improves response time, allowing measurements to be taken more quickly. If your application involves frequent handling, you'll be especially interested to know thermistors are less susceptible to mechanical shock than PRTs. The bottom line may be better accuracy in fieldwork. Additionally, higher base resistance and larger resistance coefficients make it easier to achieve precision readings with thermistors, so better resolution and accuracy are possible for a lower cost. All of these thermistors have a negative temperature coefficient of resistance (NTC). These probes come in a complete assembly ready for use, and each works well with the uncertainties of our thermometer readouts: the 1504 Tweener, the 1523 and 1524 Handheld Thermometers, the 1529 Chub-E4, the 1560 Black Stack, and the 1575A and 1590 Super-Thermometers. 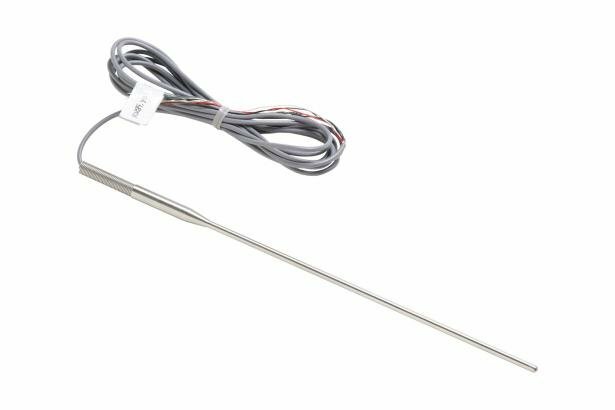 These probes provide most accurate readings when coupled with a 2563 Standards Thermistor Module or 1590 Super-Thermometer, but they are most portable when used with a handheld reference thermometer. What's more, the Secondary Reference Series Thermistors are accurate to ± 0.01 °C and cover the temperature range of 0 °C to 100 °C. They come with a NIST-traceable calibration and a resistance-versus-temperature table printed in 0.1 °C increments that can be interpolated to 0.0001 °C. NVLAP accredited calibrations as single thermistors or as systems combined with their readouts, are also available. No other sensors can match the accuracy and price combination of these high-accuracy thermistor probes. Try one and you'll agree.